In the months after the 2012 Sandy Hook Elementary School shooting, a number of gun violence prevention groups sprung into existence, vowing to fight for stronger gun control measures. But five years after the devastating massacre in Newtown, Connecticut, the body count from mass shootings has only risen, and there has been no federal legislation passed that would tighten gun control laws and background checks. Organizations like Everytown for Gun Safety, the Brady Campaign to Prevent Gun Violence and Giffords have seen multiple rounds of consolidation, staff turnover and a steady assault from the powerful National Rifle Association, which has contributed to the lack of effectiveness they’ve seen in bringing forth change on gun control in Washington, experts said. These groups, however, contend that they've made progress in other important ways: Fundraising remains robust, allowing for more hiring and the growth of policy and advocacy arms, and legislative efforts on the state level have been successful. Experts said one obstacle to success on the federal level might be the groups themselves, since there isn't a singular voice advocates can point to on the issue akin to the NRA, though the rise of just three major groups represents a step in the right direction. Weeks after Newtown, Shannon Watts, a stay-at-home mother, launched Moms Demand Action for Gun Sense in America. But just over a year later, in March 2014, the group merged with Mayors Against Illegal Guns, a group that had been founded in 2006 by then-New York City Mayor Michael Bloomberg, to form a larger, more centralized nonprofit called Everytown for Gun Safety that focused on universal background checks for gun purchasers. At roughly the same time, in January 2013, former Arizona Democratic Rep. Gabrielle Giffords, who survived an assassination attempt in 2011, and her husband Mark Kelly created Americans for Responsible Solutions, a nonprofit whose aim was to support lawmakers who supported gun control measures. All the while, the Brady Campaign to Prevent Gun Violence, which came into existence in 2000 after its prior incarnation was renamed, has maintained its own mission to reduce gun deaths in the U.S. The group, however, has recently dealt with high turnover in its communications office and has had to rely on an outside firm for some of its public relations needs. While the three remaining groups have proved to be apt outlets for the groundswell of enthusiasm for tougher gun control measures — 95 percent of Americans said they supported universal background checks, according to a November Quinnipiac Poll — the sheer number of voices in the space has still led to some disarray, a challenge that has been exacerbated by the power of the NRA. Eugene Volokh, a professor at the UCLA School of Law who has also written extensively on gun issues in the U.S., agreed, adding that the splintered voices within the gun violence prevention space may not only harm their ability to deliver an effective message, but upends any one group’s ability to persuade politicians. “Those groups are growing, or appear to be, but we will need to see if gun control groups can deliver votes the way the NRA can," he added. While Giffords compiles scorecards based on state policies and Brady conducts candidate questionnaires, the efforts pale in comparison to the legislator and candidate report cards published by the NRA’s lobbying arm. Those grades have come to be seen as a critical litmus test for many Americans whose vote depends heavily on gun and Second Amendment issues. Volokh, of UCLA, explained that lawmakers “would rather receive modest disapproval from a larger group of people than earn the undying enmity of a substantial but smaller group” like the NRA. As evidence, these experts point to the fact that despite record-high public support for gun control measures, the House just last week passed a Republican bill that would make it easier for gun owners to legally carry concealed weapons across state lines. Meanwhile, leaders of the gun violence prevention groups have acknowledged their uphill climb when it comes to federal legislation, comparing their struggle with the fight for marriage equality. Sen. Richard Blumenthal, D-Conn., who has fought aggressively for gun control in the Senate, said that while Giffords, Brady and Everytown “all have somewhat different focuses” in the face of “extraordinary obstacles like the gun lobby, the NRA, the extreme right,” it largely shouldn’t matter, given the energy they’ve harnessed. Indeed, the groups have made substantial strides on the state level in the aftermath of Sandy Hook. 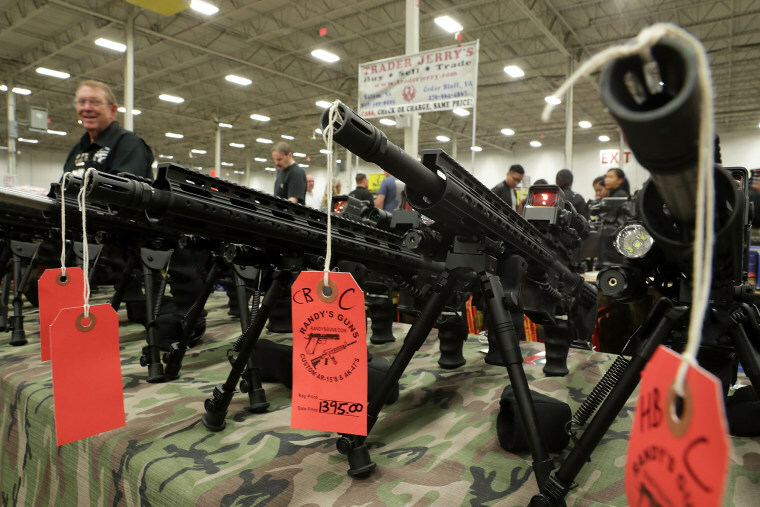 Since Newtown, Connecticut, New York and Massachusetts have all passed comprehensive gun control packages, and a total of eight states have expanded background checks for gun buyers. Another 25 states, along with Washington, D.C., have enacted bills since 2013 that tighten laws keeping guns away from people with domestic abuse convictions. The groups have also successfully defeated bills that would have allowed guns in public schools (30 states since 2015) or allowed guns on college campuses (29 states since 2014), according to a recent “Five Years Later” report published by Everytown. Officials from Giffords, Everytown, and Brady said the groups were also involved in helping to craft recent bipartisan legislation that would serve as a modest fix to the National Instant Criminal Background Check system, although it faces an uncertain future in Congress. The bill, unveiled by Sens. John Cornyn, R.-Texas, and Chris Murphy, D-Conn., last month, would attempt to better enforce current law and strengthen the National Instant Criminal Background Check system to ensure all background check information is uploaded. As 2018 approaches, leaders from the three prominent gun violence prevention groups said they’re more prepared than ever to take on the NRA, locally, and nationally.